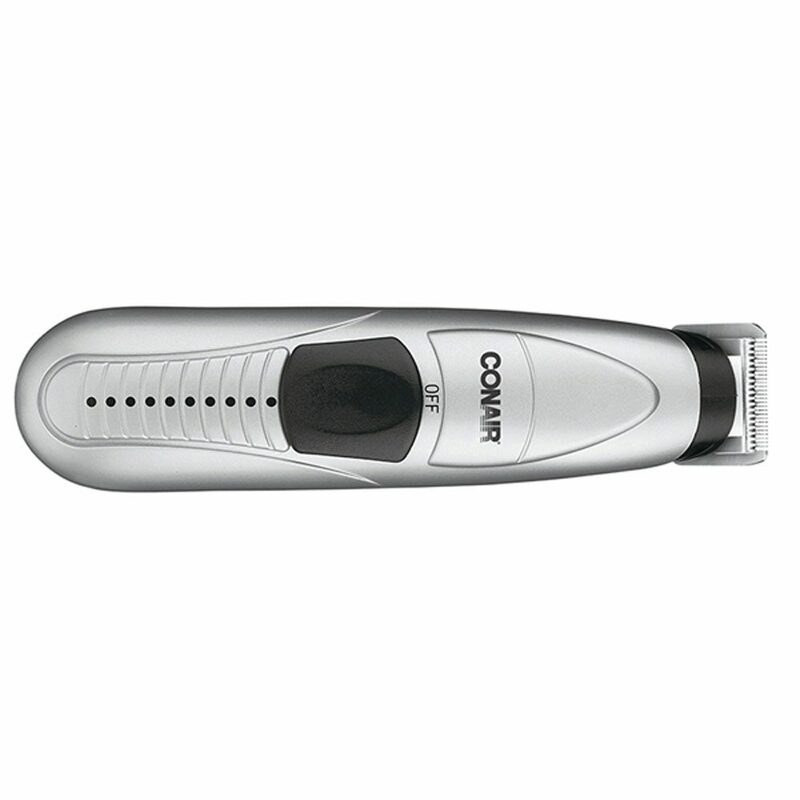 You might have heard excellent things about the features and services of Conair’s corded beard trimmers and the cordless rechargeable ones. If you want to know about the battery operated one from Conair, here is a review of the Model GMT175RCS. One thing for sure is that taking proper care of this device will make it last for years. The products from this company are durable and powerful whether it comes with a cord, no cord or batteries. The beard trimmer is grey in color with a power switch in the center that is black. Below the switch, there are many black dots. The shape is ergonomic and you can easily hold it for usage. The tools that come along are black in color. The handle is for multi-use so you can complete all your hair trimming needs with this. The beard trimmer is thing and narrow and it will allow you have the exact length you want. It is perfect for travelers as you do not need a cord. Even the rechargeable cordless ones need a cord from time to time for charging. The device is lightweight and it appears good-looking. You can take it out while travelling and people will love your choice. Its design and color matches perfectly with men of all ages. After you open the box, you will like the solidity of this beard trimmer. It comes with a hair trimming blade, precision goatee trimmer and its attachment comb, accessory holding stand, 5 position adjustable comb, 3 jawline combs, one mustache comb and a cleaning brush. You can clean the beard trimmer using the cleaning brush so that it does not have any hair stuck. Proper maintenance can make it last several years. Hair on the neck generates an illusion of a distinct jaw. Even though people have faith in that a jawline beard does this, preferably a neckline trim does. The reason is that the jawline trim will gather attention on the lower neck as it produces two separate parts while the other will retain the attentiveness on your jawline as out there is a soft shade. A soft shade around the neck also generates the illusion of a sturdier jaw as facial hair is often related to masculinity and strength. If you are trying to grow a thick beard, this trimmer will help you maintain it. Neckline trim beard can be achieved with this device. Since it is battery operated, you do not need to charge it and there are no cords. You might have to replace them if they die. The cleaning brush is used for taking care of the attachments and the beard trimmer. Make sure to take proper care so that they will last for years. Without cleaning, the trimmer can turn dirty and dusty. If you use beard trimmer with long gaps do not buy this. If you are a frequent or daily user, this should be perfect. This entry was posted in Conair on December 2, 2017 by Professional Beard Trimmer Reviewer.